Migrants wait to cross the Greek-Macedonian border at a makeshift camp, near the village of Idomeni, Greece March 7, 2016. On Sunday more than 50 Syrians and Iraqis opted to enter a European Union relocation scheme that in theory should guarantee them placement in an EU country, although they don’t get to pick which one. The hardship they have been enduring on the Greece-Macedonian border, on top of the anxiety of traversing front-lines and crossing the Aegean Sea, which has claimed 430 refugee lives this year already, led them to make the decision. But with only 325 actually relocated under the scheme that was introduced by the EU last year, they still risk being disappointed or condemned to months of living in limbo. At a scheduled mid-March summit the EU Commission plans to try to revive the relocation plan with a proposal that would see yet another “radical overhaul” of the asylum process on the continent, with asylum applications being handled by a newly created federal agency and war refugees being shared out between the EU’s member countries. Central European and Balkan officials, though, tell VOA they will reject the plan. One Syrian family who had been camped out at Idomeni for three weeks and has now opted to enter the relocation scheme is known to this VOA reporter. 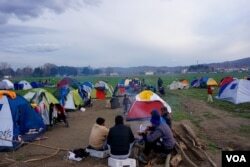 Ahmed, his wife and three young children, a boy and two girls had been at Idomeni for two weeks sleeping by the railway line that cuts the refugee camp in two. As the days passed and the conditions worsened the family progressively grew sicker, with all three children suffering from a respiratory infection that is reaching epidemic proportions among the refugees. ”We decided it was too much for us. We wanted to go to Germany — we have relatives there — but I am not sure the border will ever open and in the end the more important thing is that we reach safety. We are all sick,” Ahmed said. Another woman who left Idomeni to join the scheme is six-months pregnant and a widow. Her husband was killed in a barrel-bomb attack a month ago in the Syrian city of Aleppo. 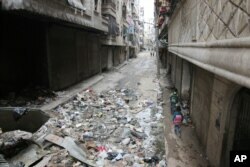 FILE - Children walk down a street in Aleppo, Syria, Feb. 11, 2016. She made the journey through the northern Aleppo countryside and into neighboring Idlib to make an illegal crossing into Turkey. She was pushed on by dread, fearing that unless she fled war-shattered Syria, she might die too, destroying the life of her baby, the child of her dead husband. “I was just getting sicker at Idomeni and I was worried about what that would do to the baby,” she told VOA. She asked for her name to be withheld as she still has family back in Syria living in government-held areas and she fears they might face reprisals. The Greek charity PRAXIS has been promoting the scheme to refugees at the border. A PRAXIS worker said they have been emphasizing that finding permanent sanctuary somewhere in Europe should outweigh their determination to head to a particular country to reunite with family. The worker asked for her name not to be disclosed as she doesn’t have permission to brief the media. Some relief workers argue, though, that it is better to have families reunited and not only for emotional and morale reasons. Relatives already settled can ease the integration of newcomers, helping them to adjust more quickly. They can also save the public purse, often aiding their newly-arrived relatives financially. Syrian refugees in particular express deep skepticism about the relocation scheme: partly because of their fierce determination to be living with or close to other family members. They have also grown increasingly distrustful of Western promises, both because of what they see as Western failure to support sufficiently the revolution against President Bashar al-Assad’s rule and as a result of Europe’s shifting position when it comes to accepting refugees. Relief workers argue their distrust is not misplaced when it comes to the relocation scheme. The EU plan announced last year to relocate 66,400 refugees from Greece has proven so far a failure. States have only pledged 1,539 spaces, and there have been only 325 actual relocations, according to Adrian Edwards, the spokesman for the UN’s refugee agency. “Greece cannot manage this situation alone. It remains absolutely vital therefore that the relocation efforts that Europe agreed to in 2015 are prioritized and implemented,” he added. Meanwhile, Macedonia continued to admit just a trickle of refugees from the burgeoning numbers at the border at Idomeni. Refugees have become increasingly alarmed at the constant rule-changes by Macedonia and other Balkan countries — including the arbitrary decision that only refugees from towns in Syria and Iraq deemed by police interviewers to be impacted by the conflict will be admitted and allowed to travel onwards to Western Europe. Three Syrians from Damascus who were among the more than 200 refugees allowed to cross at the weekend were sent back because they came from the Syrian capital, according to aid workers. Damascus is one of the towns police officials consider not to be impacted. A rule agreed to by police officials from Croatia, Austria, Slovenia, Serbia and Macedonia that would bar war refugees who have spent more than 30 days in Turkey or Greece, or any other country considered “safe,” has panicked refugees at Idomeni. Many have spent longer in Turkey than 30 days before heading to Europe. The recent Russian-backed Assad offensive in northern Syria was a tipping point for many of the newcomers to leave Turkey. Others have spent more than two weeks in Greece because of the border clampdown by the Macedonians, and at the rate the Macedonians are admitted refugees a huge proportion of the 15,000 now estimated by relief workers to be at the frontier will easily have been in Greece for longer than 30 days. A lively trade in false passports has emerged at Idomeni. Migrants from North Africa want false Syrian and Iraqi passports, knowing that they will be barred from entry because they are deemed economic migrants. Some Syrians and Iraqis VOA spoke with say they are thinking about obtaining false passports because of the Turkish visa stamps in their genuine passports.